For those steamy, humid Maryland summer days, a custom swimming pool is an incredible benefit for a family looking to beat the heat. A viable upgrade to your home, a Rhine pool allows your family and friends years of outdoor living with endless memories. With a custom pool, you have control over the most important pool features. We work with our clients to help determine what size and shape will work best with your other landscaping size, surroundings, and existing features. An in-ground pool doubles as a water feature, so you might want one that accompanies a patio or deck. You could even choose to line the perimeter with hardscaping features, like stone walls, a pergola, or a variety of plant life. Maybe you’d prefer a novelty shape for you pool; the choice is yours. With a custom pool, you can also add fun features, such as waterfalls, hot tub nooks, diving boards, or even water slides. The designs and ideas are nearly limitless! Any questions about designing and installing a custom pool? Call the experts at Rhine today; we can help you create the perfect pool for you. At RHINE Pools, we can turn your dream backyard and pool into a reality. For more information, or to schedule a visit with one of our amazing pool designers, contact us today at 410-442-2445. RHINE Pools in Howard County, Maryland can handle every aspect of your pool design. We do not only install new pools and do pool renovations we are a part of one of the very best Landscape Companies in the state of Maryland. Having this in-house power allows us to be your single source to build you the outdoor oasis of your dreams. We believe that if you build a pool it needs to be an integrated center piece of your backyard and you should be able to build that center piece with a firm that understands all of the pieces of the puzzle and who will deliver on time and on budget. A portfolio of our work is available online. 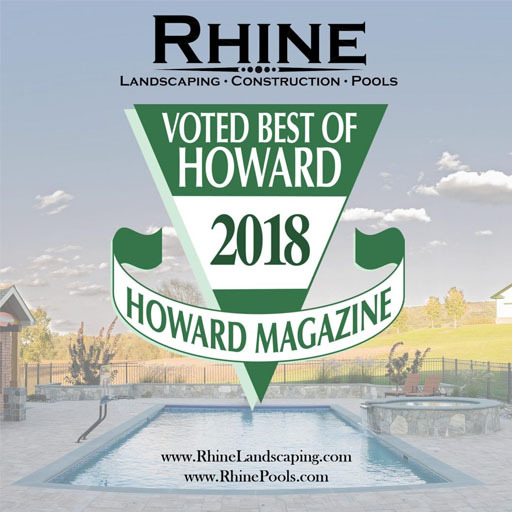 If you have any questions about a new pool or about pool renovations, contact RHINE Pools by calling 410-442-2445 or clicking here today! Read our blog for weekly tips about pools. Check us out on Facebook, Twitter, Google+ and Pinterest as well!